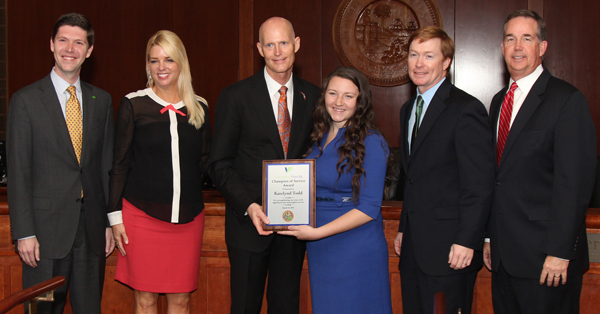 TALLAHASSEE, Fla. – Today, during a meeting of Florida’s Cabinet, Governor Rick Scott and Volunteer Florida CEO Chester Spellman recognized three champions of service from across the State of Florida: the ADT Corporation, Katelynd Todd, a student at the University of Florida, and Doug Sessions of the Ounce of Prevention Fund of Florida. ADT Corporation – ADT Corporation has 12 offices throughout Florida, including its corporate headquarters, and more than 3,000 team members in the Sunshine State – more than any other state in the country. ADT serves over 600,000 customers in Florida. ADT Always Cares is a company-wide community service program empowering team members to be a positive force in their community. ADT Always Cares allows team members to assess their city’s biggest areas of need and establish volunteer and philanthropic partnerships that effectively address these issues. A year-round effort throughout ADT, employees lead projects every week to impact nonprofits like Habitat for Humanity, the American Red Cross, the Boys and Girls Club, and local charities. Each year, ADT also celebrates its Annual Week of Service, a companywide initiative in which all employees and their families are invited to volunteer at company-sponsored charity events in its 200+ communities. In 2014, ADT employees contributed4,500 hours of volunteer service in Florida. Katelynd Todd, University of Florida student – A first-generation college student, Katelynd works with individuals and families in Gainesville struggling with poverty and illiteracy. As a third-year student at the University of Florida, she has served in several leadership positions on campus. Katelynd also created the Excellence Scholars Cabinet within the Black Student Union to help local at-risk high school students. Additionally, she founded a non-profit called Gainesville Reads, Incorporated. Katelynd volunteers weekly at a Shands palliative care program and currently serves on a City Commission Advisory Board. Katelynd has empowered students across the Gainesville community, as well as giving UF students the opportunity to serve their neighbors. Doug Sessions, Ounce of Prevention Fund of Florida – Douglas Sessions, Jr. is President and CEO of the Ounce of Prevention Fund of Florida. The Ounce of Prevention Fund is a public-private partnership that invests funds into innovative, community-based programs that serve at-risk children and their families. Doug has served the Ounce of Prevention Fund for twenty years, and under his guidance, the organization has grown to become a critical provider of innovative social service programming. Doug also currently serves as vice chair of the Florida Afterschool Network’s board of directors and is an active member and leader at St. John’s Episcopal Church in Tallahassee.